My amazing friend Abby took these shots of me outside the venue before we caught the Taoray Wang show. Most of my looks this season were a lot more casual than the seasons that I have attended in the past. 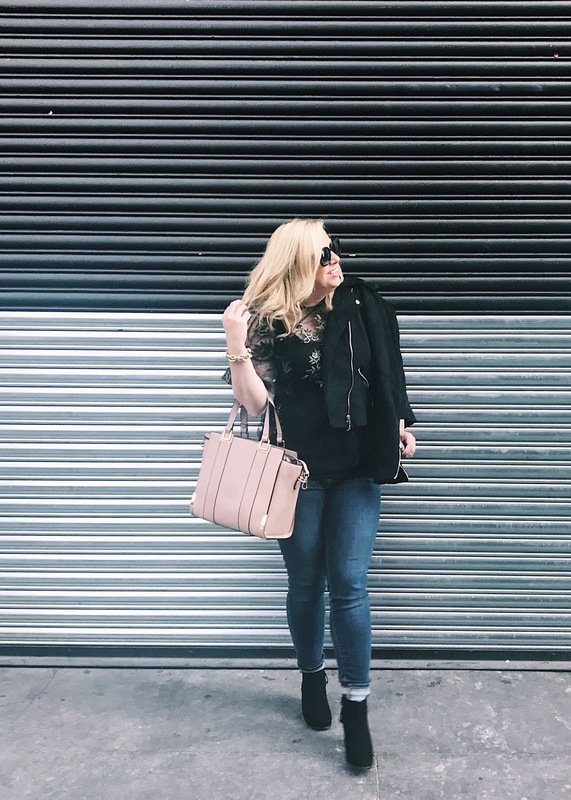 I dressed up this daytime look with this shear Zara top, black suede jacket, and black booties and still felt comfortable and pulled together for the long day of rushing around New York catching shows. 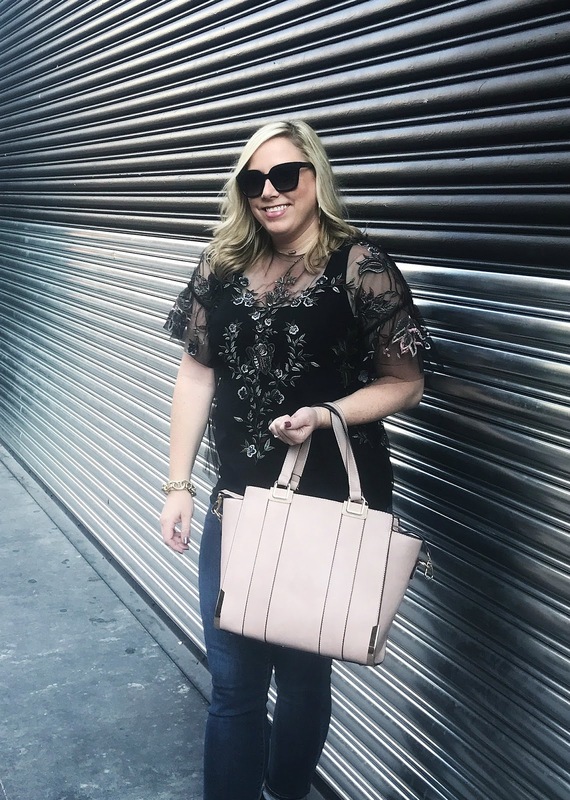 I love the detail on this top and the bag is so chic! Love the top. It's so NYC. I also love Skylight. It was so much fun hanging out there. Hello Liz! It was so much fun hanging out there! I love that "So NYC" lol :) I had a blast and hope you did too! Love that pretty top! I hope you had an amazing time! Hi Laura! I did have so much fun, hope you did too! love this gorgeous purse!! 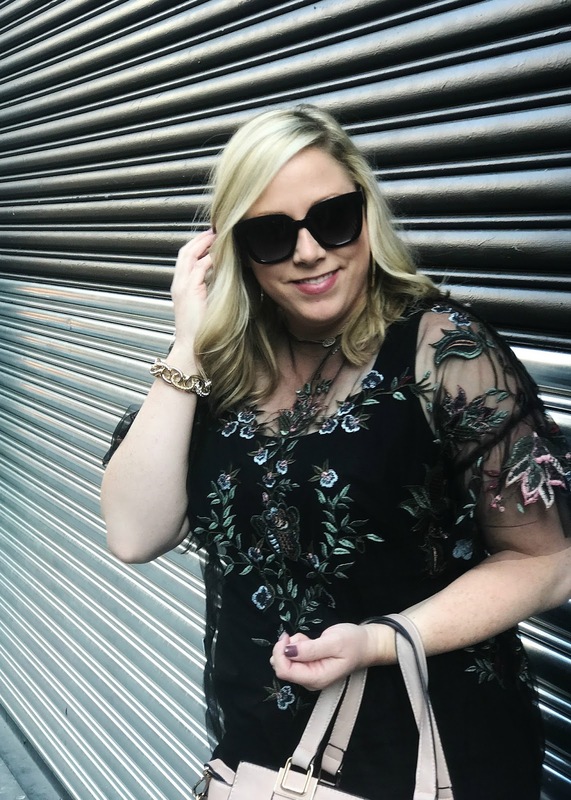 blush can go with any season! Hey girl! Blush is my FAV! I love this tote it's been on repeat since I took it to NY. It truly does go with any season! xo Thanks for stopping by the blog. Hello Anna! Thank you so much, I'm glad you love the dark colors. It's a little different for me, but I'm loving it for fall too! THANK YOU!!! What an amazing compliment! I also Love a mix between edgy and feminine. Have a great weekend girl! Hey girly! Thank you soooo much! Have a great day! Hello Emily! I'm so glad you like it! I always love the outfits you put together too! Have a great weekend! The top is fantastic! You look so beautiful - so jelly you got to experience NYFW! That top is really pretty! Love how you styled it!